I think if you set HOMER up so that measured wind data is set at say 10metres but hub height is 50m then HOMER scales automatically. This almost universal pattern occurs because the daytime solar heating causes much greater mixing in the atmosphere, and hence greatly reduced wind shear during the warm part of the day. 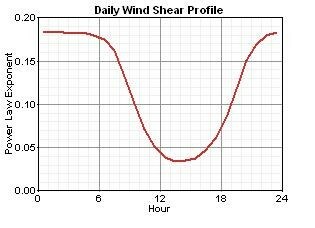 The moral of the story is that a 50m anemometer is much better than a 10m anemometer if you want to model a wind turbine with a 50m hub height. So if you have met tower data, use the data from the highest anemometer. 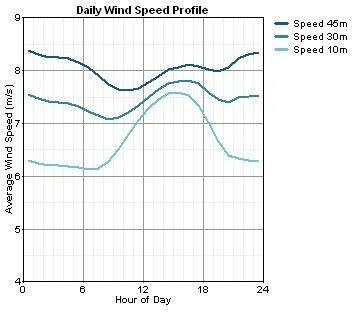 If all you have is 10m anemometer data, then just be aware that it will not represent the hub height wind speeds very well.